Looking to get rid of the dreaded unwanted arm flab? The videos below show examples of exercises that target the triceps, those crucial muscles on the backs of the arms that help you do everything from push open the door to pushing your body off the floor. With this targeted toning routine of tricep workouts, you’ll not only feel the burn in your arms, you’ll also strengthen your core and tighten up that waistline. Add these moves to your regular routine today and soon you’ll be eager to show off your toned arms! Step 4: Slowly bend your elbows to lower your body toward the floor until your elbows are at about a 90-degree angle. Be sure to keep your back close to the bench. Step 5: Once you reach the bottom of the movement, press down into the bench to straighten your elbows, returning to the starting position. This completes one rep. Step 6: Keep your shoulders down as you lower and raise your body. You can bend your legs to modify this exercise. Step 1: With a dumbbell in hand, stand or sit at a flat bench and plant your feet shoulder width apart. Step 2: Use two hands to grasp the dumbbell in a perpendicular fashion with palms facing in and up underneath the top bell. Step 3: Carefully raise the dumbbell straight overhead for your starting position. Step 4: Inhale as you use your forearms to lower the dumbbell, keeping your arms close to your head and bending your elbows completely. Step 5: Exhale as you use your triceps to raise the dumbbell back to the starting position. Step 1: Begin in a plank position with your arms straight. Your shoulders should be over your wrists and your body should form a straight line from head to toe. Keep your core engaged and don’t let your hips sag. Step 3: Press upwards back to plank position. You can start on your knees or try it against a wall or bench to modify this exercise. Step 3: Slowly elevate the bar attachment up as you inhale so it is aligned with your chest. 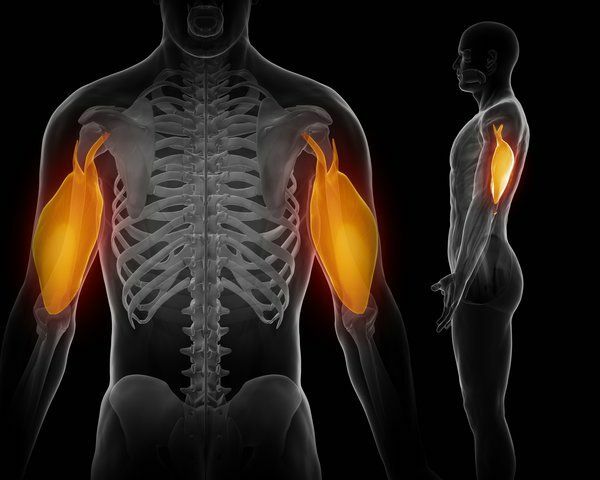 Only the forearms should move and the elbows/upper arms should be stationary by your sides at all times. 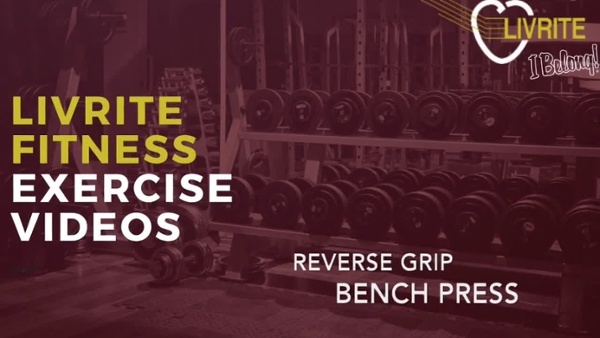 Step 1: Grip a dumbbell in each hand, lay down on a flat bench and fully extend your arms. Step 2: Without moving your upper arms proceed to lower the dumbbells by moving your forearms downward toward your head. Step 3: Pause for 1 second as the dumbbells are almost touching your forehead. Step 4: Extend your elbows to drive the dumbbells back up until your arms are fully extended, hold this contraction for 1 second. Step 1: Attach a rope attachment to a high pulley. Grasp the ends of the rope so that your palms are facing inward and your elbows are by your waist. This is your starting position. Step 2: Keeping your body stationary, exhale as you lower the rope by completely extending your arms until they are straight down by your sides. Step 3: Hold for a moment and then inhale as you slowly return the rope to the starting position.